If, like me, you are at home working in your studio today, then I highly recommend you do what I did – make yourself a nice pot of hot chai. 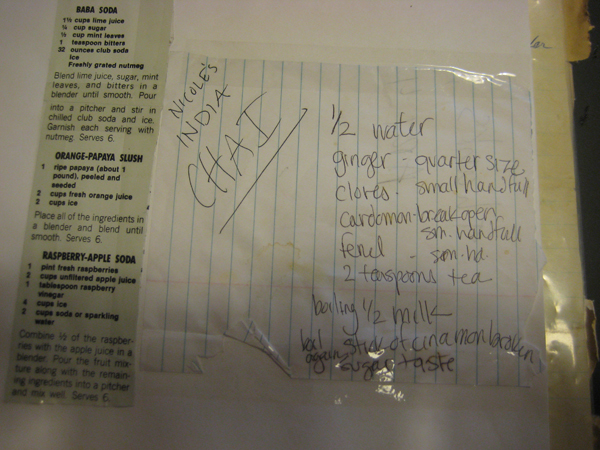 We have a great recipe that Nicole brought us back from India. Its very simple, provided you have or are willing to go and get a few great spices. 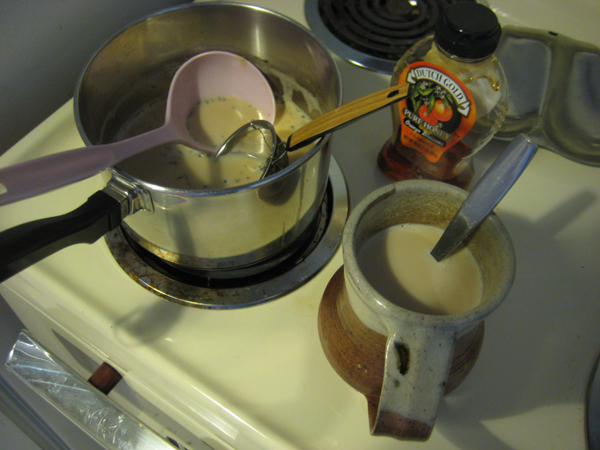 Use half water and half milk – so if you want to make two mugs of chai, start with a mug full of water. Dump that in a pot. A quarter sized piece of ginger. A small handful of cloves (just enough to sit in the bowl of your palm, not yer whole hand). A small handful of cardamon seeds, if they are in pods, open the pods first. A small handful of fennel (aka anise). And two teaspoons loose black tea. Loose tea is getting increasingly difficult to find around here, so if you cant find it maybe use teabags or rip open a couple of teabags? 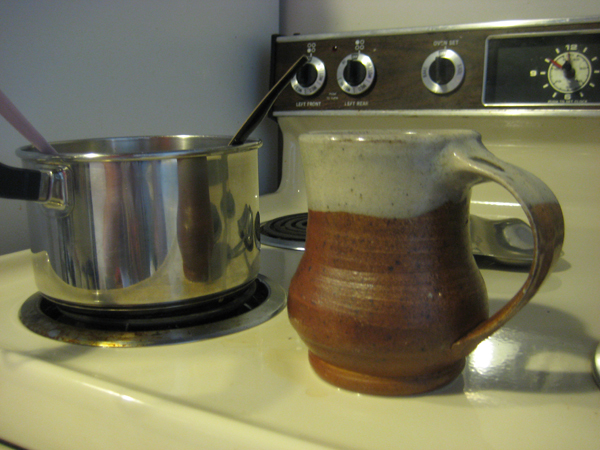 Then, when its good and boiling, add another mug of milk (or equal to whatever amount of water you used). We always have 1% milk around so that works fine. I bet heavier would taste ever richer. Cook that until it ALMOST boils. How do you know its going to boil? The milk gets a bit foamy and you can see the tea coming up to the surface. Got to watch it closely at this point because if you boil it you likely scorched it a bit and while it might still taste OK, your pot will be a pain to clean. Add some cinnamon and take it off the heat. You can use a stick or ground cinnamon, either way. Now strain it into some mugs, sweeten with some honey to taste – Yeah, honey is better for it than sugar trust me – and put on some old Pink Floyd (uh, because that’s what I would do) and relax while updating your website or whatever it is you are doing over there. Oh, and its best drunk out of a classic Greg Surman mug as pictured below, but unless you went to school with him and he made you one, you don’t likely have one of those now do you?